Some geologists are very fond of telling us that certain things take a long, long time to form. They confidently state that there is simply no other way for such structures to come about, and therefore is it simply ridiculous to assume that the earth is only a few thousand years old. If we currently see geological formations that we “know” took hundreds of thousands or millions of years to form, the earth simply can’t be a few thousand years old. Throughout the study of opals, the scientific papers and textbooks have told that the process of opal formation requires tens of thousands of years, perhaps hundreds of thousands…and some have suggested even millions. 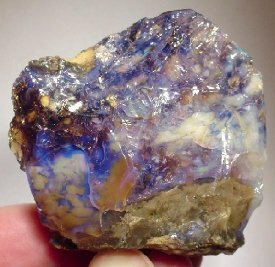 The very presence of opals on earth, then, indicates that the earth is at least tens of thousands if not millions of years old, right? Wrong! It seems that opals simply won’t behave according to the dictates of scientifically-irresponsible theories. The microbes produced carbonic and organic acids that aided the biochemical weathering of clay minerals and feldspar to produce silica hydrosol. The kind of environment required by the microbes for life indicates the conditions under which opal was produced. This enables the determination of a new timetable for opal formation involving weeks to a few months and not the hundreds of thousands of years envisaged by the conventional weathering model. So even though geology professors at my university confidently told me that opals take hundreds of thousands of years to form, the newest data indicate that opals take only a handful of weeks or a few months to form. Now don’t get me wrong. I am not trying to malign geologists by pointing out that they were off in their opal formation timetable by more than a factor of 105. I am merely pointing out the fallacy of making confident assertions based on the conclusion of models. The fact is we aren’t sure how opals form, even after this study. We only have models that attempt to explain their formation. Since these models can obviously miss crucial elements, it is important to realize that any conclusions they make are tentative. In this case, the weathering model of opal formation missed the important contribution of bacteria (at least at the Lightning Ridge site), and as a result, its conclusion was quite false. Dr. Wile, you have mentioned a “scientifically irresponsible” extrapolation of nuclear decay rates several times. However, astronomical observations have indicated that the physical laws have not varied much at all over very large periods of time (stars and galaxies have emission spectra that match what we find here on earth, etc.). Why have we not seen a major change in stellar appearance at a distance that would correspond to a period when you suggest large changes in nuclear decay occurred? Excellent question, Jason! First, you must make a distinction between physical laws and physical constants, as they are usually (but not always) different. The half life of a given isotope is an empirically-measured constant. That constant then gets plugged into an equation that shows an exponential decay pattern. The equation comes from first-order kinematics and is the physical law. The half-life is simply a measured constant that is plugged into that law. While there is no evidence that the law has changed, there is evidence that the constant has. Second, how would you expect changing radioactive decay rates to affect our observations of stars, etc.? For example, you mention emission spectra. Those are based on electrons changing orbitals and are not at all affected by what is going on in the nucleus. Third, the evidence we see right here are earth is definitely the most reliable evidence, as it deals with the fewest assumptions. The fact is, we see evidence for variable radioactive decay right here on earth. That makes it rather convincing for me. Dr. Wile, the measured decay rate (empirically-measured constant) will be set by the interaction of sub-atomic particles as governed by the strong and weak nuclear forces and the electromagnetic force. Decay rates are not fundamental physical constants themselves. Alpha decay, for example can be modeled as an alpha particle tunneling though an energy barrier produced by the competing influences of the strong nuclear force and the electromagnetic force. As for astronomical observations, emission spectra show that the electromagnetic force has been very nearly unchanging and a change in the nuclear forces would disrupt fusion in the cores of stars. For example, a reduction in the strong nuclear force would shut down fusion, which would lead to a star’s core to contract, while a subsequent increase in the strong force would fire fusion back up. Both events should cause changes in star diameters as pressure waves move out from the core from contraction and expansion. Do we see anything, say 4500 light years away, that indicates disruption of fusion inside of stars? In short, we should expect to see large effects from dramatic changes of nuclear decay rates. We don’t see these effects (change in star behavior, change in relative abundance of daughter elements in decay chains, relative abundance of fission products from the Oklo natural nuclear reactor). Some have claimed to find some evidence of a small variation in the fine structure constant based on astronomical data and the Oklo reactor, but nothing that indicates a change in nuclear decay rate by a factor of a million in the earth’s crust. So why state that physicists and geologists have been irresponsible? You certainly haven’t demonstrated that they are only relying on a mere extrapolation from a 100 year measured baseline. More to the point, what reasons do your physicist colleagues give you for their conclusion that decay rates have been very nearly constant over billions of years? Have you asked them why they persist in holding to that conclusion? Once again, this is why I rely on the data observed right here on earth. While it is difficult to understand what to look for in a distant star when it comes to variable half-lives, it is easy to know what to look for here on earth. As Humphreys and others did, you can look at helium buildup in zircons. As Reifenschweiler did, you can look at radioactive decay directly as you vary the environment [O. Reifenschweiler, “Reduced Radioactivity of Tritium in small Titanium Particles”, Phys. Lett. A, 184:149, 1994]. As Jenkins and others did, you can measure radioactivity over the seasons. These all produce evidence for variable half-lives. I state that the methods are irresponsible, not the physicists and geologists. The methods do, indeed, rely on the extrapolation of roughly 100 years’ worth of data over billions of years. They do this in spite of the fact that there is strong evidence right here on earth for variable radioactive decay. Thus, the methods are quite scientifically irresponsible. Of course I ask my physics and chemistry colleagues why they persist in holding on to the illusion of constant half-lives. Most of them say we haven’t seen any variation. When I mention the data that demonstrate that variation, they try to partition those data away and call them “exceptions” rather than the rule. However, there is no evidence to indicate they are exceptions. Others say that our current understanding of nuclear processes doesn’t allow for variable half lives. That’s certainly true, but we know that our current understanding is wrong, because we have data that show variable half lives. Others say that they “can’t imagine” a way that half lives could be variable. Of course, their imagination is irrelevant. The data show that it happens, so before we start extrapolating about a hundred years’ worth of observations over billions of years, we need to come to a better understanding of nuclear processes! Dr. Wile, I haven’t been able to come across Dr. Chaffin’s 1994 paper, but I have been able to find a 2003 paper by him discussing this topic (Chaffin, E. F., 2003. Accelerated Decay: Theoretical Models, Proceedings of the Fifth International Conference on Creationism, 2003, Creation Science Fellowship, Inc. pp. 3-15). Figure 3 shows a variation of about an order of magnitude change in decay constant over a range of potential well depth values. He notes that larger changes could occur with a change in alpha particle energy. All this said, I don’t see a reason why large changes should be expected to have happened in the past (Chaffin’s well depth modeling doesn’t give 6+ orders of magnitude change and we don’t see such shifts today). I agree that we find variation in decay rates, just not anywhere near the extent needed to invalidate radiometric dating. Side note: what would be the change in nuclear fusion rate for a given change in decay rate. How little is little? If the scientists are using irresponsible methods they are being irresponsible. I don’t see how a distinction can be made between method and practitioner when so many are involved over such a long time. Someone (other than a creationist) should have blown the whistle a long time ago. I am startled that the physicists and chemists you have spoken to have no knowledge of observed changes in decay rates. Jason, we rarely start scientific inquiry by finding a reason for what happens. Usually, we see an observable phenomenon and then try to model how that phenomenon could happen in a way that is consistent with the scientific laws we currently know. Once we have a reasonable model, then we might look for why such a thing happens. Thus, while I agree that it is hard to see a reason why large changes should have happened in the past, there is evidence that they have. Thus, models should be developed to see how this change could have happened. I disagree that the variation in decay rates is nowhere near the extent needed to invalidate radiometric dating. The work of Humphreys and others indicates an increase in radioactive decay rates by a factor of 10^6. Now this is not direct evidence, so it is not as strong as variable decay rates that have actually been measured. Nevertheless, it is evidence. Also, even if the Humphreys data are invalidated in some way, the fact that we have directly measured some variation in radioactive decay now tells us our understanding of radioactivity is poor, since we don’t expect to see any variation. Thus, it doesn’t make sense to extrapolate such a poorly-understood process over billions of years. You ask, “what would be the change in nuclear fusion rate for a given change in decay rate. How little is little?” That’s a question that can’t be answered until there is a reasonable mechanism for how the change in decay rate occurs. While some good ideas have been put forth, none have been fleshed out enough to determine their details. Until we know those, we have no idea how it will affect other observables. Your point is well taken, however. Once we have some idea of the details, we should see how it affects other observables to determine whether or not we could look for evidence elsewhere. I see a very simple distinction between the method and the practitioner. You see, as a scientists, we often use scientifically-irresponsible methods. My colleagues and I are fond of making “back of the envelope” calculations that help us decide how to set up experiments, make detectors, etc. These “back of the envelope” calculations contain so many wild assumptions that we know they aren’t true – they are scientifically irresponsible. However, we understand that, and we use them just as a guide to get us to the first step. Now…we would become irresponsible scientists if we started using those “back of the envelope” calculations to make definitive statements about reality. So scientists can use scientifically-irresponsible methods as long as they understand the weaknesses of those methods and don’t try to make definitive statements with them. I find your comment, “Someone (other than a creationist) should have blown the whistle a long time ago.” That’s like saying “Someone (other than an opponent of BCS theory) should have blown the whistle on high-temperature superconductors a long time ago.” Since BCS theory said that no high-temperature superconductors could exist, no one who believed in BCS theory was looking for them. It took a couple of “crackpots” (Bednorz and Mueller) who didn’t believe in BCS theory to discover the phenomenon. I am not at all startled that most of my nuclear physics and nuclear chemistry colleagues are unaware that variable half lives have been observed. They have been indoctrinated to believe that it can’t happen, so they aren’t exactly looking for the studies that report on it. Also, science is so specialized that most scientists spend time reading only the research in their specific speciality. Since there are few who actually study radioactivity as a physical process (most nuclear physicists and chemists just use it), there are few who even read the papers that report on it. Dr. Wile, Humphrey’s work has its critics as you know. What papers I have read by him on He diffusion seem centered on the same 6 samples. I am quite interested in seeing his results replicated as well as his proceeding to use He diffusion analysis to date other samples. I would think that more confirmation of Humphrey’s results are needed before declaring radiometric dating to be entirely invalidated. Is there any phenomenon we have total knowledge of that could be used for dating? Wouldn’t any dating technique be “scientifically irresponsible” since knowledge of physical phenomena is provisional? 1. Are decay rates known to vary significantly for the isotopes used in the dating techniques used? 2. Do other dating techniques (such as He diffusion) indicate that although variation in the decay rates found today are small, they must have been larger in the past? My understanding is that BCS theory is still alive and well. Perhaps Bednorz and Mueller didn’t “didn’t believe” in it so much as they looked where theory didn’t indicate they would find anything. Just because a new phenomenon is found doesn’t mean that the earlier theory is not an accurate description of the earlier known phenomenon. I guess the question is whether a new theory which explains high temp and low temp superconductors comes around which obsoletes BCS theory. Maybe one has; I don’t know. Jason, Dr. Humphreys does, indeed, have his critics, as does Dr. Hawking, Dr. Collins, etc. Whether or not a scientist has critics is not relevant. What is relevant is whether or not the critics have valid criticisms. I have read the criticisms of Dr. Humphreys’s work, and I cannot find valid criticisms. I certainly agree with you that Dr. Humphreys’s work needs to be replicated with other samples from other places. That’s the process of science. However, that work is not the only reason to question radiometric dating. There are many lines of evidence that show there are serious problems with radiometric dating. What Dr. Humphreys’s work does is give a reason behind why those lines of evidence exist. You ask, “Is there any phenomenon we have total knowledge of that could be used for dating?” I don’t think there is anything we have “total knowledge” of, but there are processes that we seem to understand very well that serve as responsible dating techniques. I think dendrochronology is one of them. While there are some minor issues involved which indicate that it gives us more of an upper limit than an exact date, scientists seem to understand why those issues exist and why they are limited in their effect. There are even some reasonable tree-ring chronologies that span more than one tree. There are some irresponsible ones as well, but they are easy to spot. Just look at the T-values: lots of low T-values mean an irresponsible tree-ring chronology. You also ask, “Wouldn’t any dating technique be “scientifically irresponsible” since knowledge of physical phenomena is provisional?” Definitely not. You don’t have to be totally sure of a physical process to extrapolate. You simply have to be careful. The longer your extrapolation, the more careful you need to be. There are so many problems associated with radioactive dating that it is definitely not being careful to take its conclusions as definitive. I agree with the questions you propose being addressed. I would be a bit more stringent, however. I would say that given the problems that we know exist with radiometric dating, given the fact that we know radioactive decay is variable, and given the fact that there is some evidence that variation could have been huge in the past, it is best to not trust radiometric dating until such questions are answered. Data from radiometric dating could (and will) still be published, but the numbers should be taken with a grain of salt. BCS theory is, indeed, alive and well. Most physicists think that there is a completely different mechanism that produces high-temperature superconductors. My point was not that BCS theory is wrong. My point is that everyone who believed it had no motivation for looking for high-temperature superconductors – they thought BCS explained it all. Only those who didn’t believe it went looking, and that’s who found them. Thus, those who don’t believe in a reigning paradigm are the ones who typically show its faults. As a result, you would expect young-earth creationists to be the ones who blow the whistle on radiometric dating. Thus, your statement that you would expect others to blow the whistle makes little sense. Dr. Wile, while you do not find valid criticisms of Dr. Humphreys’ work, others do. Are we left with a postmodern tug of war here? I can add links to the “Answers in Creation” website in reply to your “True Origins” website link and we could ping pong various website links for a long time. As it stands, Humphrey’s work should be revolutionary, yet it isn’t being followed up by anyone. YEC criticisms of standard theory have been around for decades, but no progress seems to be made. Do you think this is due to just intransigence on the part of one or both sides, or is there more going on? Do you find the Humphrey’s paper you linked to more or less “irresponsible” in its usage of simplifying assumptions than that of radiometric dating papers in general? He uses assumptions of isotropy of diffusion in biotite and spherical symmetry of the crystals to make the problem “tractable”. How is this worse than assuming near constancy of decay rates, especially in light of Section 13 of Humphrey’s paper where he mentions that accelerated decay in his model (and any other Flood model(!)) would lead to the melting of the Earth’s crust? His attempted explanation for the crust not melting is to invoke inflation as a mechanism of bulk cooling along with a hand-waving thought that maybe this wouldn’t lead to the freezing of Noah and friends through some base temperature of space. He wraps up that section saying that the theoretical details need working out but he is pretty sure there must be a solution to the heat problem because here we all are. I don’t see how geologists are to be asked to take this seriously when no further work with other samples has been done and Humphrey’s theoretical cooling mechanism is yet to be figured out. At the present time both standard natural history and YEC natural history have serious deficiencies. Inflation was first invoked to explain the smoothness of the CMB, but has serious problems (Steinhardt, Paul J. (2011) “The inflation debate: Is the theory at the heart of modern cosmology deeply flawed?”(Scientific American, April; pp. 18-25)). There is also still no working theory for abiogenesis. YEC has several major deficiencies. Perhaps it is because he thinks big, but Humphreys is quite often the one suggesting deeply unconvincing ideas (planets started off as balls of water that were then magnetized and then transmuted into their current composition, the above mentioned mitigated accelerated decay scenario, etc.). Where does this leave us? Are both fundamentally wrong? As for the variation of nuclear decay rates, it seems that it is mainstream scientists who found the variations in the examples you have given so far (save Humphreys’ He diffusion). The point of contention is now whether the variations found are enough to invalidate radiometric dating. And what counts as “irresponsible”. Jason, we are not left with a post-modern tug-of-war here, because the critics of Humphreys do not make their case when it comes to his helium in zircon study. The evidence is still on Humpreys’s side. That might change at some point, but it certainly isn’t the case right now. When it comes to radiometric dating in general, we could ping-pong sites back and forth. Nevertheless, what no one can deny is that many radiometric dates are either inconsistent with one another or inconsistent with the known facts. Also, we now know (contrary to the confident statements of many radiometric dating advocates) that radioactive decay rates are variable, at least to some extent. These two incontrovertible facts indicate that any responsible scientist must be skeptical when it comes to radiometric dating. You say, “YEC criticisms of standard theory have been around for decades, but no progress seems to be made.” I don’t see it that way at all. It was creationists who found carbon-14 in both fossils and diamonds in which there should be no carbon-14 at all. Those studies have resulted in people who do tandem accelerator mass spectrometry trying to properly determine the actual background in their experiments. So far, these attempts cannot attribute such results to background. While creationists are not the only ones who have produced evidence for variable decay rates, they are the ones who have produced evidence for the largest variations. Thus, progress has been made. The progress is just slow. This is not surprising, because an ancient earth is a bedrock for evolution, which still is the dominant paradigm in the natural sciences. As such, it will take a long time for it to fall, if it ever does. This isn’t so much because of intransigence on both sides. Instead, it is the way science works. It takes a long time for scientific paradigms to shift. I do find the Humphreys paper (on balance) a bit more responsible than many papers that use radiometric dating. First, the extrapolation he uses is much less outrageous than the extrapolation to billions of years. That doesn’t mean it is correct, of course, but I do think it is more responsible. I also think he does something important – he uses his hypothesis to produce a prediction about something that hasn’t been measured, and then he has an independent group make the measurement so he can compare it to his prediction. The data compare quite favorably to his prediction. This is a significantly better approach than most radiometric dating studies, where measurements that do not fit into the preconceived framework are simply thrown out. Now at the same time, I will say that there are many who use Humphreys’s data irresponsibly, claiming that it “proves” the earth is young. That is, of course, absurd. As you have already pointed out (and I wholeheartedly agree), these data need to be reproduced in other samples before you can even be sure they are 100% real. At that point, you still don’t have proof – you simply have mounting evidence. As to his specific assumptions, I do think the isotropy and spherical symmetry are more reasonable than the assumptions made in radiometric dating. First, we know the radiometric dating assumptions are wrong in many cases, and we know that those assumptions lead to dates that are inconsistent with one another or inconsistent with other well-defined data. In comparison, the isotropy assumption is quite consistent with what we know, and the crystals can be shown to have roughly a spherical symmetry. Thus, those assumptions are certainly more reliable. The heat issue is not an assumption – it is a problem that comes up as a result of the conclusion. However, that is not unusual in science. Often new data produce apparent problems, and those problems have to be considered and worked through. What would be irresponsible is to ignore the problem. However, that’s not what’s happening. Humphreys is quite up front about the problem, and the creationist community is working to understand the problem better. I agree that Humphreys’s proposed solution is based mostly on hand-waving, but the fact is that people are working on the problem. I absolutely agree with you that “At the present time both standard natural history and YEC natural history have serious deficiencies.” I don’t think this means both are fundamentally wrong, although that is certainly a possibility! I think what you are seeing is a shifting away from standard natural history because of its many serious deficiencies. Not many scientists are shifting to YEC, but some (like John C. Sanford and Arlton C. Murray) are. I personally think that many of the serious deficiencies in the YEC view are simply the result of not enough research being done. As the shift away from standard natural history increases, however, there will be more research done into alternative ideas, including YEC. In time, we (or another generation) will see whether or not I am correct in my view. You are also correct that “The point of contention is now whether the variations found are enough to invalidate radiometric dating.” However, I don’t think there is a question as to whether or not taking these dates as trustworthy is responsible. Given that our current understanding doesn’t even allow for what has already been directly measured, it is quite irresponsible to extrapolate 100 years’ worth of observations over billions of years. If our understanding of radioactivity becomes good enough to explain the observed data, that might change. Right now, however, to do so is clearly scientifically irresponsible. Dr. J. Wile, you set up a few straw men for yourself to shoot down. Nowhere, ever, has any geologist said that all minerals or sediments or metamorphic rocks or igneouse rocks takes ‘millions’ of years to deposit. Nowhere, ever, has any geologist used the time of formation of opal as evidence for an old earth. Nowhere has any geologist used radiometric dating to determine how long opal takes to be formed. Why can’t creationists just once stop misleading people? Louis, I am not sure I understand your comment. Nowhere in the post did I even imply that geologists say “all minerals or sediments or metamorphic rocks or igneous rocks takes ‘millions’ of years to deposit.” In fact, I was very specific to say, “Some geologists are very fond of telling us that certain things take a long, long time to form.” Also, nowhere in the article do I even mention radiometric dating or try to connect it to how long opals take to form. Now, a commenter did bring up radiometric dating, and I did answer his questions. Even in my answers, however, I do not attempt to link radiometric dating to the conventional view of opal formation. These two comments make me think you were reading someone else’s article, not mine! Dr. Wile, you *are* intent on maligning geologists for your own benefit. You are too willfully ignorant to acknowledge that there could be various ways for opals to form and none of them supports a young earth. You are like so many creationists, willing to use science as long as it makes you comfy but ignorantly attacking it when it shows your myths to be just that, stories by primitive peoples. Vel, it is clear by your comment who is intent on maligning someone…and it isn’t me! Dr. Wile, I disagree with your contention that the variation found so far is enough to discredit radiometric dating, but I think that this will have to be a problem resolved by those actively studying the matter. My point regarding geologists to having to take Humphreys’ results so far seriously is because he has only done an analysis on six samples from a single drill site and claimed that this establishes a new dating technique that undermines those used currently. More work simply _must_ be done to at least confirm the results elsewhere before reaching that conclusion. I am much less sanguine about the chances of YEC than you it seems. Only time will tell. Thank you for your time. Jason, I appreciate your comments. I don’t say that the variation so far is enough to discredit radiometric dating. I say that the variation so far, combined with the other problems of radiometric dating, are enough to make any responsible scientist skeptical about radiometric dating. As an encouragement to creationists considering such work, we offer the following opinion: high He retentions are probably the rule, not the exception. Otherwise the large amount of geoscience literature reporting great (U-Th)/He chronometry ages (Section 9) would not exist. That is because the method essentially divides the amount of He retained by today’s nuclear decay rate, so large retentions of He are necessary to get great ages. If their zircons had lost most of their He by diffusion, their dates would be in great disarray, and usually rather young. Because their zircons are often of similar size as ours [Reiners, 2002], the He loss rates will be similarly fast. That suggests young diffusion ages such as ours will turn out to be common. So not only is he saying that these data probably indicate the phenomenon is widespread, he is encouraging others to continue the work. And as I said before, I agree that his results need to be confirmed on a much wider scale. I am not surprised that we have different opinions on the chances of YEC. I am actually glad that we do. Science stagnates when all scientists agree with one another. Thank you for your time as well! As we can always see from creationist sources, they think that an anecdote is an argument. It isn’t. Care to show us where peer-reviewed scientific article a uses the argument? If you can’t, I don’t believe you. Yes, you are. That certainly is a very valid question. I’ll ask it again while rephrasing it a little bit: Dr. Wile, if you were correct about Opals forming from a “recent flood” or “Creation”, why aren’t they abundant in early Mesozoic, Paleozic and Precambrian rocks in my country?. It is a very valid question. Nowhere, ever, has any geologist used the time of formation of opal as evidence for an old earth. My anecdote is, indeed, an argument to show that your statement is 100% false. You claimed that “Nowhere, ever” has this been used as an argument for an old earth. I have given you two examples of where it was used by geologists as an argument for an old earth. Once again, then, the facts demonstrate that you are the one who is trying to mislead people. Now that you have been caught in your attempt to mislead people, you are backpedalling, asking where a “peer-reviewed scientific article a uses the argument.” That’s not what you said initially. And once again, like your other two original comments, this is misleading, since I never claimed that the argument had been made in the peer-reviewed literature. I simply said that geologists have used the argument. As I have demonstrated, they clearly have. I truly wish you would address the science rather than trying to mislead people. I agree that the question raised by the geologist is a good one. However, had he studied Flood geology for even a bit, he would have found the answer. As the data show, the layers in the geological column are not records of different eras. Instead, they are records of different ecosystems that were captured as the Floodwaters rose. As the study I blogged about suggests, it takes several components in order for opals to form. There need to be specific chemicals as well as specific bacteria. Thus, you would expect opals to be found in the geological column only where the layers preserve the ecosystems that have all those components. Early Mesozoic, Paleozic and Precambrian rocks do not preserve the ecosystems that have those components, which is why you do not find opals in them. Wow!! THOROUGHLY enjoyed that post. The opal is my birthstone and I have always been fascinated by them. So, they’re now thinking it takes weeks to months due to bacterial processes, as opposed to millions of years? Incredible… evidently it struck a very sensitive nerve for some! Elizabeth, what I really think struck nerves was the fact that geologists can be demonstrated to be so wrong, despite the fact that they speak so confidently about things they have never seen or directly tested. Yes, that’s what I meant. It appears to challenge fundamental assumptions used to interpret observations/data. I learn a lot from the opposing views/responses in these comments. I am glad that the comments help, Elizabeth! I have NEVER seen an argument like the one you just had with Jason H. Good for both of you. Jake, it is very nice to discuss something with someone who concentrates on arguments rather than insulting rhetoric.